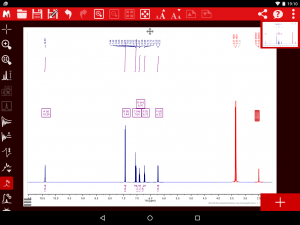 The Mnova Tablet app in its full version contains all the basic functionality described in the free version (we recommend you to read the tutorial to get you started in the basic tablet app options and visualization tools) plus the main NMR processing parameters and analysis tools, as well as some extra visualization options. For basic functionality (i.e. referencing, normalization) and visualization of the spectra you can have a look at the free version functionality tutorial. 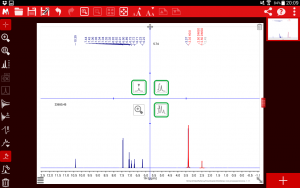 The crosshair tool is enabled with the main analysis parameters: peak picking, integration and multiplets analysis and also with the zoom in tool. Used when the signal decays rapidly to zero producing an abrupt truncation of the FID. 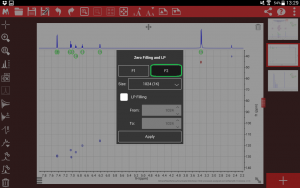 Zero filling is used to set the size of the Fourier Transform and Linear Prediction is a mathematical procedure where a missing part of a FID can be constructed in order to increase the digital resolution of the spectrum. You can edit the zero filling and linear prediction window functions as per in your Mnova desktop version. 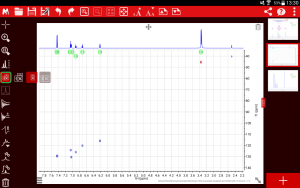 Phase errors can be easily rectified in software by applying a lineal combination of the real and imaginary components of the spectrum in order to obtain pure phase lineshapes. You can use the following interface to adjust any phase shift. Modern spectrometer hardware uses oversampling and digital signal processing to improve the baseline, but some undesirable broad signals arise from real sources. Just click on the baseline icon as shown below and this will execute a ‘Full Auto’ baseline correction for you. 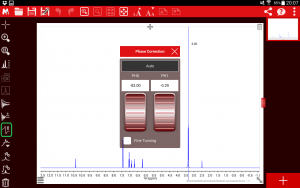 Peak picking and integration can be perform automatically (tapping on the peak picking and integration icons on the left toolbar). 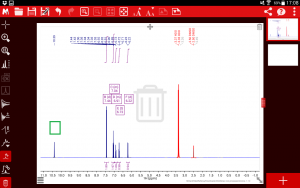 Multiplet analysis has to be performed manually. In addition to all the visualization tools available on the free version, the full version allows you two more ways to zoom in the spectra. One way is to use the crosshair tool dragging it across the spectra as per the analysis tools. 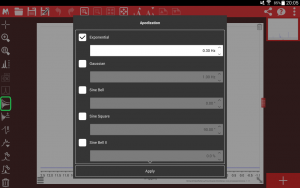 Another option, possibly the recommended one, is to select the zoom in icon on the tool bar and drag across the spectra. Deleting multiplets, integrals, etc. You just need to select the delete icon on the bottom left corner and then select what you want to delete on the spectra. Remember to unselect this tool to come out the deleting mode. Both dimensions f1 and f2 are enabled for 2D processing. Select the traces icon highlighted below, and then just pick a suitable display mode. Traces will be automatically displayed once you select the view option. 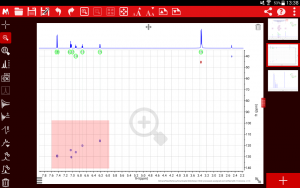 For 2D spectra, the only difference is that you have to drag across (diagonally) the desired area to zoom in.